People who criticize for a living are treating Criminal rather criminally, as if it were some punching bag. I'm seeing reviews as low as 3, and as high as 6. Don't be fooled, it's way better than all that. Granted, though evocative of something by Michael Mann, like 2006's Miami Vice, it falls short of ringing that bell. But it's also a heck of a lot better than Taken or many things by Liam Neeson, and I love that guy's films (! ), particularly when compared to action outings by, say, Nicolas Cage (who's mostly been wandering in the desert since 1995, a caricature of something past on SNL). 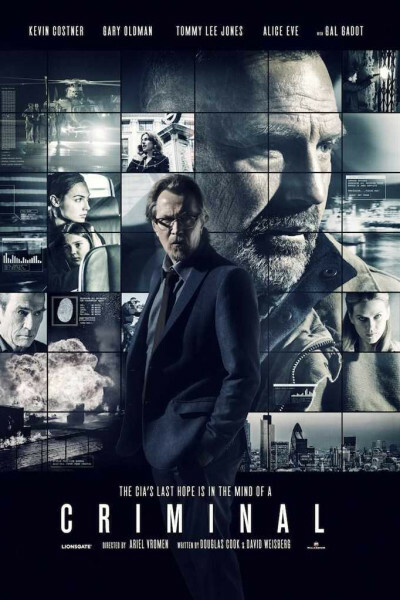 Admittedly, my standards for 'action movies' aren't particularly high, but Criminal—which is a UK production—is well-polished and pretty glossy, not some patchwork of wasted car crashes, junky scenes, or vapid actors. For cryin' out loud, this one has Kevin Costner, Ryan Reynolds, Gary Oldman, Gal Gadot (Wonder Woman), and ol' hangdog himself, Tommy Lee Jones, whose face needs some Spanx. Now, to be fair, yes, some of the writing feels very 'Michael Bay,' and there are moments when Costner just sorta scratches his head and acts befuddled, pretending to be as confused as Frankenstein's chihuahua waiting for a walk. But man, the fight scenes, as basic and sociopathic and un-Bourne as they are, are satisfyingly, gruntingly brutal. Anyone who stands in Costner's way is gonna get a fully-loaded ice chest to the face. Anyone who won't lend him his van is gonna get headbutted to the asphalt. Anyone who tries to depart the scenes of his crimes is gonna get hatcheted in the forehead. Relishing his rare anti-hero role, Costner spends a long while stomping on our memories of Robin Hood and Lieutenant Dunbar like a dandelion beneath a boot heel. There, that'll do it. No more flower. Ryan Reynolds' screen-time is more than I anticipated, a good 20+ minutes. Spoiler alert, fem-fans: he keeps his shirt on, but it's the sort Obama wears beneath his oxfords. Gary Oldman assumes a role he has inhabited many times before: man on a mission, hellbent on achieving a greater good, even if it requires bending some rules along the way. Gal Gadot is good, but I remain unconvinced that she belongs in so many blockbuster films. Maybe I'm wrong and she's the cause! But to my way of thinking, she remains a cipher, sheeny and glisteny on the outside, but vapor. Fast & Furious 6, Furious 7, Triple 9, Batman v Superman, here (Criminal), and perhaps even in the upcoming Wonder Woman and Justice League films, TBD. She's being cast in film after flashy film, none of which allow (or require) much range, breadth, depth. Will these roles pound her to powder, fine as dust yet wispy and gaseous as Henry Cavill is becoming? These are all 'pretty face' films, and I'm holding out hope after hope that she will have either the chops or opportunity or both to show some deep emotions that feel real. When she cries in Criminal, which she often does, it feels mostly like she simply got something in her eye. I felt zero empathy. She evokes only detachment, always. Triple 9 was the same way; she could have done or made lots more with it, but either the director kept her in a box, or she doesn't have the capacity, perhaps yet (? ), to blow up the box and spring open like some enormous angel with thunderously fluttering wings that darken the sky and blow debris up, up and away. That's what I'm wanting: some oomph from her. Less weightlessness, more gravity and gravitas. Time will tell; it always does: whether she goes down in history as the super-looking superhero in bedazzled costumery, or a true thespian who evolves into well-received character-actor roles in her late seventies. Tommy Lee does fine here, which amounts to 'little to no acting really required.' I love the guy; he's a national treasure, but I often get the impression he's just flat-out bored and inconvenienced. Like he's so over and beyond Hollywood and its silly games. The Harvard grad who periodically asks himself, "How in the heck did I wind up here, doing this, with these yahoos in Halloween make-up?" But this gruffness is also part of his charm, amounting to cinema's version of Damon Wayan's irascible In Living Color character, Homey D. Clown, who used to scowl and bark during children's birthday parties, "I don't think so! Homey don't play that!" You gotta love Jones: this 'dress up tea party stuff' is so silly; just get me off-set and back to my San Antonio polo ponies where I can hit stuff. Oh, for those who dig music, Criminal includes one particularly gorgeous electronica song, appearing early in the now-infamous van, and again at end-credits' roll. To save you some hunt-time, it's called "Drift and Fall Again," by Madsonik. Costner's character (Jericho, by the way) bobs and weaves to it, thumping the steering wheel with his thumb, and so will you. Bottom-line, if you're blood-squeamish or a pacifist, Criminal's a hard pass, but if you love Neeson and miss him, or enjoy Bourne and Bond or anything Costner, it's a slam dunk. It's neither a 9 or a 10, nor a 3 or a 6. I'd say it's more like a strong 7, maybe an 8.5 if you're crushin' on Reynolds, Costner, or Gadot, each of whom appeared to have their own giddy and squealing fans in last night's theater. p.s. The highlight for me was going with a dear friend [and his beloved bride], finally home after 13 arduous weeks in the hospital. Love you, guys. Glad we got to break bread again as a tribe, and watch those flickering images set to sound. Here's to another, and many more.